Priyanka Chopra and Nick Jonas are all set to embark on a new journey. The couple have already kick-started the pre-wedding functions in Jodhpur. Yesterday, Nick’s parents Denise and Paul Kevin Jonas arrived in Jodhpur ahead of the couple’s wedding which will take place on December 2. Upon their arrival in Jodhpur, the Jonas and Chopra family yesterday had a gala time at NickYanka’s Mehendi ceremony. We all know that Priyanka Chopra will be wearing Ralph Lauren for her wedding. Everyone was wondering which designer she chose for her Mehendi ceremony! Well, we know who that lucky designer was. Yes, it was none other than Manish Malhotra. PeeCee, who shares a great rapport with Manish, opted for his ensemble for yesterday’s function. Interestingly, Priyanka and Nick were wearing Manish Malhotra at the Ganesh Puja which they performed at Madhu Chopra’s residence before flying off to Jodhpur yesterday. 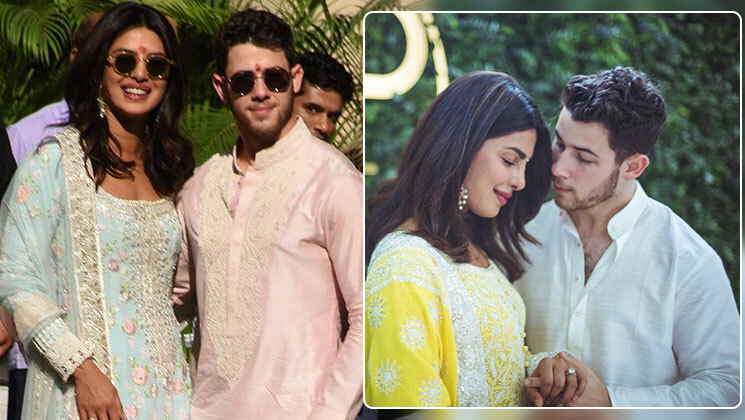 At the Puja, Priyanka was wearing a pastel blue embroidered suit while Nick Jonas opted for a pastel pink kurta. Both of them looked extremely adorable and pretty at that function. Talking about NickYanka’s Mehendi ceremony, we hope that either Manish or at least Priyanka shares pictures from her last night’s ceremony. Stay tuned as we will bring you all the latest updates about this wedding of the year.